This article is about rail-bound freight cars. For the vehicles from the Mario Kart series, see Kart. For the Yoshi transformation from Yoshi's New Island, see Mine-Cart Yoshi. Mine Carts, also parsed Minecarts and referred to as simply Carts, are vehicles that are found in several Donkey Kong and Mario games. They often serve as a means of transportation in rollercoaster-type scenarios, where the characters are required to avoid incoming obstacles as the Mine Cart moves them forward. The Kongs riding a Mine Cart in Mine Cart Carnage from Donkey Kong Country. Mine Carts first appear in Donkey Kong Country, where they are featured in Mine Cart Carnage and Mine Cart Madness. After jumping into a Mine Cart, Donkey Kong and Diddy Kong will not have any control over the Mine Cart's speed and can only jump with the Mine Cart. As such, the Kongs must carefully jump over any obstacle, pitfall, or enemy that gets in their path. Krashes are a type of Kremling who ride a Mine Cart in the opposite direction of the Kongs, as an attempt to ram into them. There are numerous tipped over Mine Carts throughout Mine Cart Carnage, acting as obstacles. These Mine Carts often appear at the dead-end of a rail, or on the very short rails before the level exit. In Mine Cart Carnage, the Kongs use a single Mine Cart throughout the whole level, and they carry the Mine Cart as they jump. In Mine Cart Madness, they use multiple Mine Carts throughout the level and are able to jump out of them. The main purpose for doing so is to jump into the following Mine Cart positioned at the start of the next railing. Sometimes the following Mine Cart has a Krash in it, who sits motionlessly at the starting point of the rail. By jumping on the Krash, the Kongs can hijack its Mine Cart and ride it. Mine Carts are replaced by Roller Coasters in Donkey Kong Country 2: Diddy's Kong Quest and Toboggans in Donkey Kong Country 3: Dixie Kong's Double Trouble!. Diddy and Krash ride in Minecarts in Donkey Kong 64. Mine Carts reappear in Donkey Kong 64 during the Mine Cart Ride challenges and also during the minigame, Minecart Mayhem. There is a Mine Cart Ride in Jungle Japes, Fungi Forest, and Creepy Castle, which are done by Diddy Kong, Chunky Kong, and Donkey Kong respectively. The main objective of each challenge is for the Kongs to collect 50 coins (or 25 in the final Creepy Castle challenge) while riding their Mine Cart in exchange for a Golden Banana. Krashes reappear from Donkey Kong Country, and reprise their role as enemies who ride in a Mine Cart. If the active Kong takes damage while in the Mine Cart, they lose some health and a few of their obtained coins. From the Mine Cart, they can also lean either left or right to activate a switch. In the minigame Minecart Mayhem, the objective is for the Kong to ride their Mine Cart around the different rail paths and avoid crashing into another cart that is carrying a TNT Barrel. Donkey Kong riding a cart in Donkey Kong Barrel Blast. Minecarts reappear in Donkey Kong Barrel Blast only in the Scorching Canyon course. Toboggans also reappear in various courses. They function the same way as they did in previous Donkey Kong games. 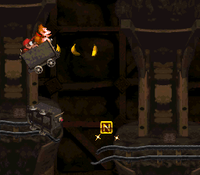 The Kongs riding a Mine Cart in Bombs Away, a level from Donkey Kong Country Returns. Mine Carts reappears as a vehicle in Donkey Kong Country Returns and its Nintendo 3DS port, Donkey Kong Country Returns 3D in a total of six levels: Crazy Cart, Rickety Rails, Grip 'n' Trip, Bombs Away, Prehistoric Path, and Roasting Rails. They are most common during the Cave world. Unlike its previous appearances, if the Kongs take damage even once in a Mine Cart, the vehicle is destroyed and the Kongs instantly lose a life. The Kongs usually jump with their Mine Cart just like in the level Mine Cart Carnage from Donkey Kong Country, but in the levels Rickety Rails, Grip 'n' Trip, and Roasting Rails, the Kongs jump out of the Mine Cart. In these levels, the player can move the Kongs while they are airborne. They must carefully move the Kongs back into the Mine Cart, because if the Kongs miss, they fall directly through the track rails and lose a life. The Kongs cannot ride in the Mine Carts with blue crystals, as they bounce off the crystals by attempting to enter the Mine Cart. During the boss fight against Mole Miner Max, the Kongs walk around on some Mine Carts that are filled to the brim with bananas. Mine Carts make another appearance in Donkey Kong Country: Tropical Freeze, operating similarly to its predcessor, Donkey Kong Country Returns. However, they can now take up to two hits when the Kongs are not using any Crash Guards, except in Hard Mode, where taking damage even once will cost the player an extra life. The player can use more camera angles while riding a Mine Cart, such as a behind-the-back perspective, and can carry the Mine Cart with them into an Arrow Barrel. Mine Carts are used in the levels Trunk Twister, Sawmill Thrill, High Tide Ride, and Rocket Rails. A cart-like vehicle referred to as a lorry appears in the Club Nintendo comic "Mario's Picross". Mario finds the lorry in a pyramid after trying to escape from a Chomp Rock that has been released through a trap door. The plumber jumps into the lorry which immediately begin to move very quickly. Though he can escape from the rock, the rails reach a dead end, making Mario crash through the pyramid's wall. In Super Mario RPG: Legend of the Seven Stars, the Minecarts are featured in Moleville Mines. The track consists of two parts: a "3D" maze-like course collecting speed-boosting mushrooms, and a "2D" portion collecting coins. The goal is to clear the mines in the fastest time possible. This marks their first appearance as a minigame in the Mario series. Mario and Luigi in Mine Carts in Mario & Luigi: Superstar Saga. 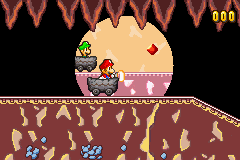 In Mario & Luigi: Superstar Saga, another minecart-themed game appears called Mysterious Mine Carts, in which the brothers split up trying to collecting red and green diamonds while avoiding obstacles all at the same time. Cart were introduced to the Yoshi franchise in the game, Yoshi's Island DS, though the vehicles appeared in only two levels: High-Speed Cart Race and Quit it Already, Tap-Tap! and they have yet to make another appearance. When a Yoshi gets on a Cart, it rides the track on its own. Yoshi can jump, but with the momentum of the cart he will always land back in it unless he lands on another platform. A cart is seen in a village hut in Spear Guys' Village Found!, but is blocked off by walls. 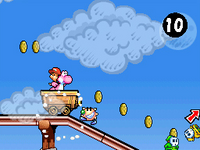 In Yoshi's New Island, a Yoshi is able to transform into a Mine Cart by entering a Whirly Gate in certain levels. The form is controlled using the Nintendo 3DS's gyroscope, while pressing any button causes the Yoshi to jump. As a nod to their Super Mario RPG: Legend of the Seven Stars and Mario & Luigi: Superstar Saga appearances, minecarts are present in Chapter 5-3 of Super Paper Mario in the Floro Caverns. This time they are more alike to a roller coaster than an actual minigame. One of the minecarts requires the player to flip into 3-D while riding it to move on through the level. According to The InterNed, the music that plays during the minecart ride is "Truck GO". Minecarts appear in Paper Mario: Sticker Star in Bowser's Snow Fort, where they are treated like an amusement ride famous within Shy Guys. These carts are red and have a Shy Guy face marked on the sides. Mario can again jump with them to avoid gaps and collect coins. Some scraps of the rails must be collected via Paperization. The music played while riding minecarts is entitled "Go Go Trolley! ", and is a remix of Super Mario 64 theme "Slider". A Minecart in Super Smash Bros. Brawl. Minecarts also appear in certain levels of the Subspace Emissary in Super Smash Bros. Brawl. To activate them, one must jump inside them. The arrow on it indicates the direction it's moving in. In the stage The Great Cave Offensive in Super Smash Bros. for Wii U, the Minecarts from Kirby Super Star make an appearance. The player can ride in them. The player can also push them out of the way. 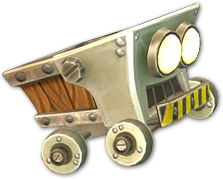 A Minecart from Wario's Gold Mine in Mario Kart Wii. 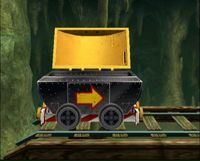 In Wario's Gold Mine of Mario Kart Wii, minecarts can be seen going along the mine tracks. These minecarts contain gold and have Wario's emblem on the sides. They act as obstacles in some parts of the course, and any player who hits them will be knocked away. Some minecarts can be seen in Wario Shipyard from Mario Kart 7, where they serve entirely as decoration. Minecarts return in Mario Kart 8 and Mario Kart 8 Deluxe in the remade Wario's Gold Mine, however, they are actually helpful this time, since they are hovering on anti-gravity rails, and thus the players can gain Spin Boosts upon colliding with their wheels. In Mario Kart Arcade GP DX, Mole Miners can be seen riding Mine Carts on tracks in the background of Bananan Labyrinth. Carts reappear in Captain Toad: Treasure Tracker acting similarly to how they appeared in previous games. The player is able to throw turnips from these by aiming with the Wii U GamePad's gyroscope sensor. In the Nintendo Switch version, the player cannot use the gyroscope sensor to aim in TV or tabletop mode. During normal gameplay, this section disables the pointer interaction of the game in every version; however, using co-op mode with two Joy-Con allows Player 2 to interact with the environment on screen normally, and can still fire red turnips from the same place Player 1 can. This allows players to collect more coins that were not previously possible to collect in Mine Cart-based levels. A Mine Cart looking similar to the ones in Donkey Kong Country Returns appears on the eastern side of the Donkey Kong Board in Mario Party 10, where it moves on a circular rail, carrying some bananas. It only has a decorative purpose. In Mini Mario & Friends: amiibo Challenge, minecarts are useful vehicles that carry Mini Diddy Kong throughout his levels. They are spotted on small platforms, and the character can get a ride from these minecarts if fallen inside. However, they cannot be controlled whatsoever, as they follow the paths they are currently preparing to roll on. It is best the player installs girder platforms above the pits encountered on the paths so that the minecarts can follow their ways undisturbed. They stop only after crashing into a ledge, and respawn on the same small platforms aforesaid. Minecarts borrow the appearance they had in the latter Donkey Kong Country games. The Kongs ride a Mine Cart in an early E3 2010 build of Donkey Kong Country Returns. Torokko Truck, a general term for a trolley or cart in Japanese, from the English loanword "truck" 「トラック」 torakku. This page was last edited on April 19, 2019, at 07:28.